Trip : She was the still point of the turning world, man. I never got over that girl. Never. I mean, you know. I loved a lot of ladies, but not like that. That was real. I’ll never forget the first time I saw her. I didn’t know what had hit me. I didn’t know what to do, cause it was so easy with all the other girls, but she wouldn’t look at me. That girl drove me crazy, man. They had killed themselves over our dying forests, over manatees maimed by propellers as they surfaced to drink from garden hoses; they had killed themselves at the sight of used tires stacked higher than the pyramids; they had killed themselves over the failure to find a love none of us could ever be. In the end, the tortures tearing the Lisbon girls pointed to a simple reasoned refusal to accept the world as it was handed down to them, so full of flaws. We knew that the girls were our twins, that we all existed in space like animals with identical skins, and that they knew everything about us though we couldn’t fathom them at all. We knew, finally, that the girls were really women in disguise, that they understood love and even death, and that our job was merely to create the noise that seemed to fascinate them. 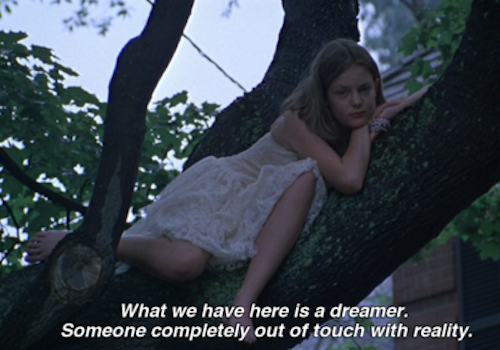 Basically what we have here is a dreamer. Somebody out of touch with reality. When she jumped, she probably thought she’d fly. The diary is an unusual document of adolescence in that it rarely depicts the emergence of an unformed ego. The standard insecurities, laments, crushes, and daydreams are nowhere in evidence. Instead, Cecilia writes of her sisters and herself as a single entity. It’s often difficult to identify which sister she’s talking about, and many strange sentences conjure in the reader’s mind an image of a mythical creature with ten legs and five heads, lying in bed eating junk food, or suffering visits from affection aunts. Most of the diary told us more about how the girls came to be than why they killed themselves.